I arrive in Catania, Sicily for an extended painting expedition April 29. Six of my students will join me May 4th for a two week workshop. We will explore and paint Taormina, Siracusa, Vittoria, Ragusa, and Agrigento - among other exceptional locations on this sun drenched island. On May 19th, Beryl Landau will join me. We will begin our slow journey to northern Italy in Cefalu. After a week in Cefalu, we will proceed to the mainland stopping in Matera, Ostuni, Aquila, Rome, Florence and Lugo in Emilia-Romagna. My studio at 351 Lewis Street in Oakland will be closed during this period. There will be no Last Sunday Open Studios. 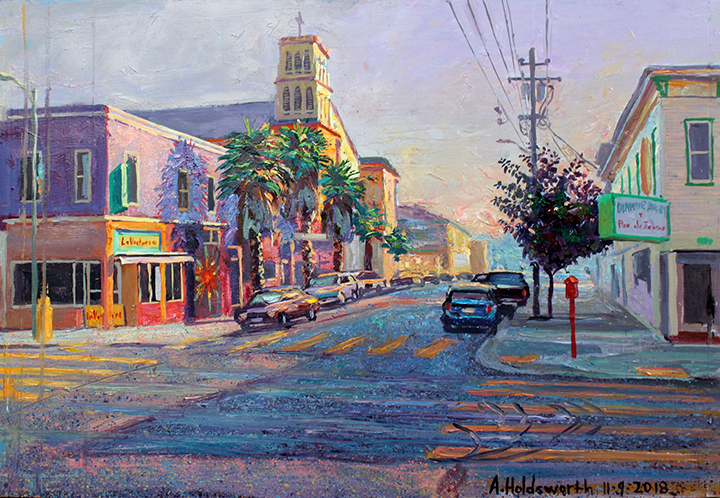 During our absence you may find some examples of Beryl Landau’s and Anthony Holdsworth’s paintings at Luna Rienne Gallery, 3318 22nd St., San Francisco. Luna Rienne will feature some of our best works from our Italian painting tour as well, as new paintings of San Francisco, in October, 2019. My arrival in Italy in the late Sixties utterly changed my life. I reached Florence penniless having hitchhiked from Paris. By chance, I was offered a job helping clean up the churches after the catastrophic flood of Nov 1966. I soon became Head of Outdoor Restoration for the Uffizi. Thus I was able to live for a year and half in a tiny rooftop apartment just a stone's throw from the Palazzo Vecchio at a time when the historic center was still a thriving Italian city. Almost below my 'attico', on Via dei Rustici, was a tiny butcher shop. The butcher would compose extemporaneous verse to accompany each purchase. Also close by was a trattoria frequented by Florentine transvestites. The traditional quality of Florentine life was a revelation to me. I could walk fifteen minutes into the hills beyond the city walls and stand in fields where the 'contadini' were ploughing with oxen. Or I could wander the narrow streets of the Oltrarno where craftsmen still practiced trades initiated in the Renaissance. One of my favorite places to hang out and sketch was the Mercato Centrale which, in those days had a large outdoor market filled with wheeled carts with bright awnings. What made the most lasting impression on me, as an artist, was the intimate connection between the art on the walls of the churches and the daily life of Florentines. I returned to Italy, for the first time, in the mid eighties with Beryl Landau. We enjoyed traveling and painting in the 'Bel Paese' so much that we continued to visit every other year. This exhibition features a small selection of the work we created over these three decades. The 38 minute video that we will screen at the Istituto is a visual diary of our last two month painting excursion. Though mostly focused on our travels from Catania, Sicily via the Aeolian Islands, Naples and Rome to Emilia-Romagna, it also makes passing reference to the huge changes that I have witnessed in Italy since the mid Sixties. It features guitar and mandolin music by Hugo Wainzinger and Al Fabrizio. After the screening we will answer questions about our travels and our paintings. Join us!